Written by Colin Nederkoorn on June 25, 2014 . Do you know how many of the people who start a free trial end up paying you real money? Customer.io has improved from a bad conversion rate to a slightly less bad conversion rate. Here it is reported from our internal dashboard: We currently convert at 3% from sign up to paid. For every 100 signups, we get about 3 paying customers. (edit: I reported this wrong. Our conversion rate is actually 6 – 10%) Your conversion rate might be higher, or it might be lower. Whatever your number is, it is likely your conversion rate will be vastly different to ours because your business is different. Everything you do affects your free-to-paid conversion. Do you require a credit card up front? Are you acquiring signups through advertising? Can people understand what your product does before signing up? Do support questions get answered quickly? 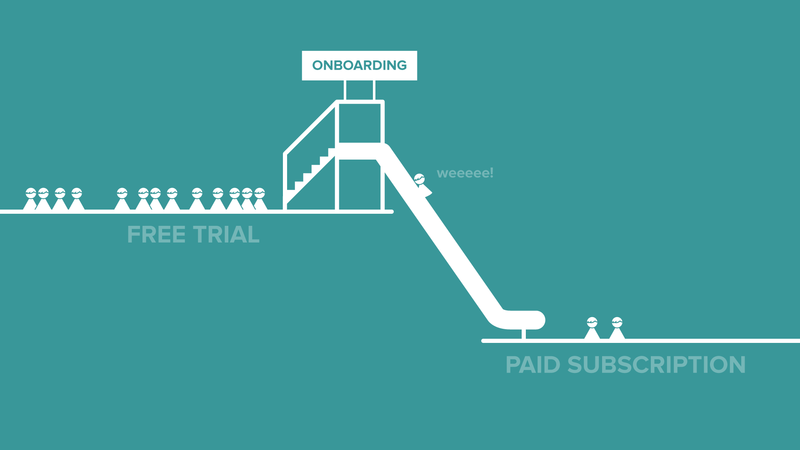 How helpful are your on-boarding emails? How quickly do pages in your product load? There’s a free tier with no time-pressure to pay. We don’t do paid advertising — all signups are word of mouth or from reading blog posts like this. Sign ups receive our lifecycle emails to help them get started. Our entry level paid plan is $50 a month. We have a features page and pricing to hopefully pre-qualify signups. Knowing what to change and what to test can be a bit overwhelming. Should you drop your free tier? 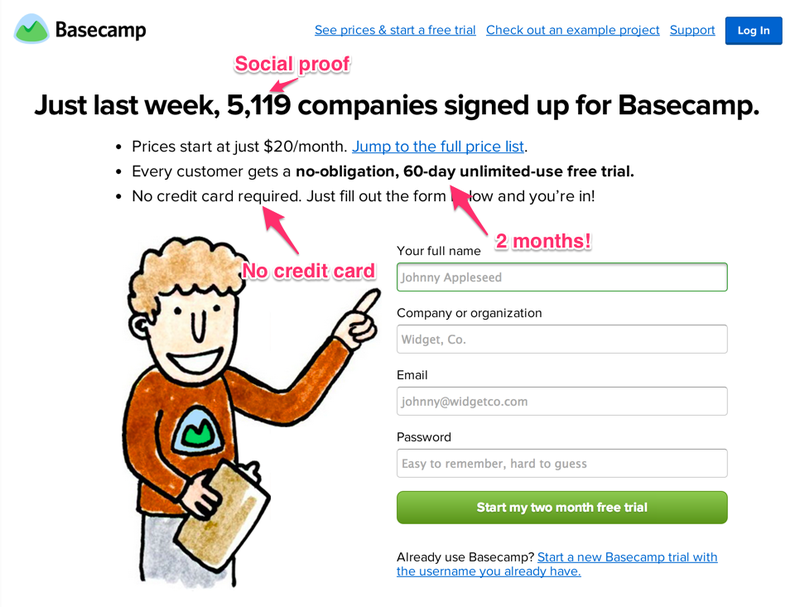 Or change your pricing, or have a 60-day trial like Basecamp does? If you’re a SaaS business where the average customer has more than $2000 in lifetime value, it may be worth some time to try “Concierge Onboarding”. Can Concierge on-boarding improve free to paid conversion? For the past several months, I’ve been hearing people talking about “Concierge Onboarding”. What to work on (SaaS): Concierge + automated onboarding, pricing strategy, paid acquisition, scalable content generation, lifecycle email. My triggered campaign is simple. I’m sending an email to people who have signed up, 2 days after they sign up. However, I want to ignore the people who sign up with free email accounts (like Gmail, Hotmail etc..). 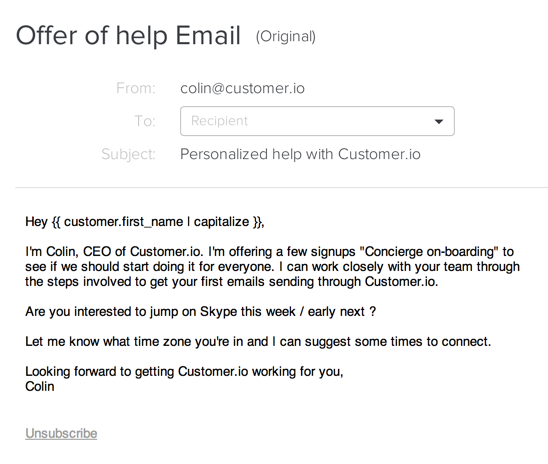 I don’t have enough time to offer Concierge Onboarding to everyone and in our experience, people who sign up with personal email accounts don’t convert as well. I also want to track a “conversion” for my campaign. We want to track how many people end up as paying customers. Feel free to steal my email copy. One temptation I had initially was to use software to streamline booking time in my schedule. Asking people to click on a link to book an appointment didn’t get as high a response rate as this more manual process. Since I actually want to talk to people, I decided to schedule more manually. If you want to see how offering concierge onboarding compares to not offering that service, you can create a 50/50 split a/b test. In an A/B test, a common thing to do is to test two different emails to see which copy does better. However, rather than sending the variation, you can configure the email to send you a notification: That way you’ll be able to make a mental note of who didn’t get an offer. They are now in your control group. Can concierge onboarding double our conversions?